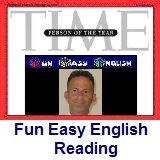 ﻿ Fun Easy English - reading practice and learning about the holiday English Language Day. These languages are used at meetings of various UN organizations, particularly the General Assembly (Article 51 of its Rules of Procedure), the Economic and Social Council, and the Security Council (Article 41 of its Rules of Procedure). Each representative of a country may speak in any one of these six languages, or may speak in any language and provide interpretation into one of the six official languages. The UN provides simultaneous interpretation from the official language into the other five official languages, via the United Nations Interpretation Service. The six official languages are also used for the dissemination of official documents. Until a document is available in all six official languages, it is not published. Generally, the texts in each of the six languages are equally authoritative. Hey this is definitely the most important holiday of the year....at least for English teachers and students. lol. All of you should spend the entire day on the Fun Easy English site and, of course, tell all of your friends to come and visit. lol. 1. When is UN English Language Day observed? 2. UN English Language Day was established by which of the following? 3. UN English Language Day was established in which year? 4. Which of the following in not an official language of the United Nations? 5. At meetings of various UN organizations each representative of a country may speak in any one of which of the following?